Looking for a resilient pair of women's specific fit boots that will support your active lifestyle and serve you well in your line of work? Tired of poorly-made work boots that fail to keep your feet warm and dry? Maelstrom is here to save the day and provide you with a pair of boots that are not just made for walking! These waterproof boots are made for rainy and snowy days, for smooth and rugged terrains, for running and hiking. Introducing The Maelstrom TAC FORCE 8'' Women's Black Waterproof Tactical Boots Featuring full-grain cowhide leather and fitted with an iH20-text waterproof lining, these boots take water resistance and durability to a whole new level. They are reinforced with a dynamic 3-sole cushioned system that will offer you maximum support regardless of the environment or the terrain. Their upgraded breathable lining is perfect to keep your feet cool and dry, yet warm enough in the freezing winter days and nights. The Ultimate Tactical Work Boots. Whether you work in law enforcement, security or an industrial plant, these boots will prove to be irreplaceable by providing optimal fit and unmatched comfort. Plus, you can practically wear them everywhere, including every outdoor activity such as hiking, mountain climbing, backpacking or any outdoor adventure! With a blood-borne pathogen resistant lining and an slip and oil-resistant rubber bottom, you can feel secure and safe. 100% Risk-Free Purchase. These boots are manufactured with only high-quality fabric and materials and they are designed for women with high expectations. That's why they are covered under Maelstrom's umbrella of a 1-year warranty. Indulge Yourself In Superior Quality And Comfort. Place Your Order Now! PREMIUM LEATHER & CRAFTMANSHIP: These waterproof work boots are manufactured specifically for women's fit and they feature full-grain cowhide leather that delivers matchless comfort and durability without sacrificing breathability or flexibility. Combine that with the dynamic 3-sole cushioned system and the YKK side zipper and you have the ultimate tactical boots that fuse functionality and comfort. 100% GUARANTEED WATERPROOF: Engineered with Maelstrom iH20-Tex waterproof lining, these work boots are guaranteed to be completely waterproof, perfect for rainy or snowy winter days or nights. They will keep your feet dry and cool regardless of the environment. 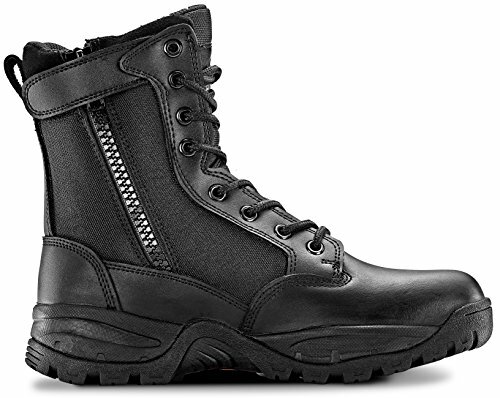 MADE WITH THE ACTIVE WOMEN'S NEEDS IN MIND: Commonly worn by law enforcement, security personnel, hikers and outdoor enthusiasts, these lightweight black women's waterproof boots feature an slip and oil-resistant bottom, perfected for active women on a variety of different terrains and environments. ALL DAY & NIGHT SUPPORT: These athletic black boots were made for active and professional women on the go. Featuring lightweight and flexible materials able to absorb shock while improving arch flexibility, these boots will never let you down. Plus, they are blood-borne pathogen resistant for your peace of mind. SHOP WITH CONFIDENCE - All Maelstrom men's boots are designed in the United States and manufactured in ISO9001-certified factories for superior quality. They're also backed by a 1-year manufacturer's warranty. If you have any questions about this product by Maelstrom, contact us by completing and submitting the form below. If you are looking for a specif part number, please include it with your message.